Enviably situated on the shores of sparkling Cayuga Lake in New York state's Finger Lakes district, Ithaca is noted for spectacular gorges and a remarkable collection of 150 waterfalls within a 10-mile radius of downtown. In an area known as the wine region of the East, local landscapes underscore the scenic beauty signified in the meaning of "I Love New York." Left behind by glacial movements two million years ago, New York's Finger Lakes resemble handprints scratched into the earth's surface. Of these 11 long, deep, and narrow freshwater lakes, Cayuga is the longest at 40 miles. In Central New York, midway between Buffalo and Albany, Ithaca is 225 miles from Manhattan, 230 miles from Philadelphia, and 250 miles from Toronto. With four distinct seasons, the destination attracts boating enthusiasts, summer vacationers, fall foliage seekers, winter sports enthusiasts, and a year-round student population. 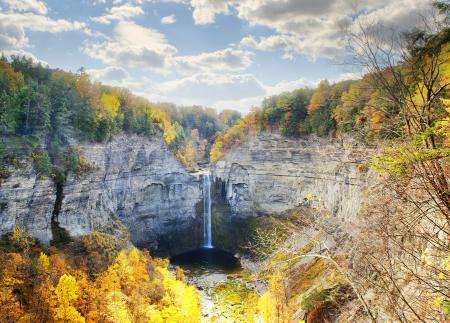 Distinctive waterfalls and gorges are Ithaca's signature look. 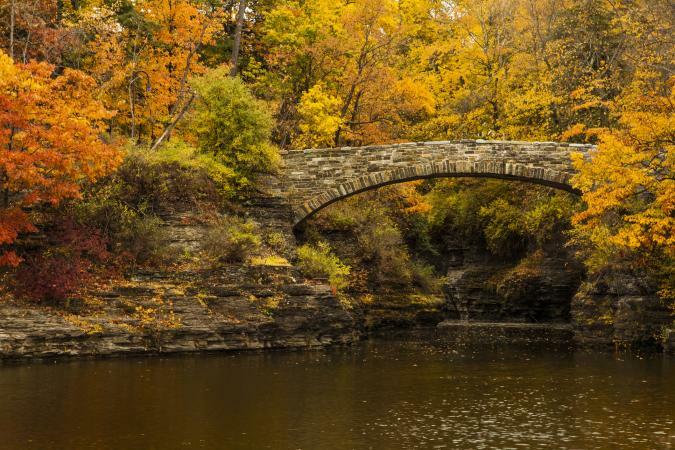 Considered among the loveliest college campuses in America, Cornell University is the location for some of Ithaca's most notable landscapes. The campus provides access to hiking Fall Creek Gorge and Cascadilla Gorge where eight waterfalls drop hundreds of feet to downtown Ithaca. See the largest, Ithaca Falls, at 105 feet high and 175 feet wide. Within 10 miles from downtown Ithaca, Robert H. Treman State Park has the devilishly named Lucifer Falls and its plunge pool, Devil's Kitchen. Buttermilk Falls State Park delivers views of 500-foot watery descents in a series of cascades and rapids, and with a 215 foot drop, Taughannock Falls is even taller than New York state's renowned Niagara Falls. Less than 25 miles west at Seneca Lake, Watkins Glen State Park has 19 waterfalls connected by 800 stone steps on three wooded trails running over, under, and along gorges open mid-May through early November. Ithaca Commons is a pedestrian magnet. The downtown hub for retail and entertainment, it's a popular venue for seasonal outdoor concerts and festivals, a farmers market, people-watching, eating out, and shopping. You'll find lots more to see and do in the area too. 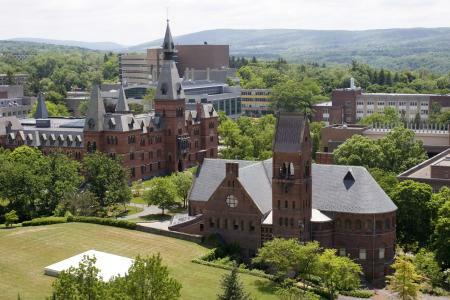 A vibrant college town fueled by buzzy brainpower, Ithaca is home to Cornell University, Ithaca College, and Tompkins County Community College. At the Ivy League university, the campus features six buildings on the National Register of Historic Places and the 2,800-acre Cornell Botanical Gardens. Join a free guided walking tour to see campus highlights or come in summer for the outdoor concert series on the Arts Quad. Downtown's handsome centerpiece is the historic 1,600-seat State Theatre of Ithaca. Built in 1915 as a vaudeville palace, the venue hosts more than 75 annual events such as concerts, theatrical productions, dance performances, comedy shows, and classic movies. Wine is an important year-round theme, as Ithaca serves as the gateway to Cayuga Lake Wine Trail, the first of its kind in America. 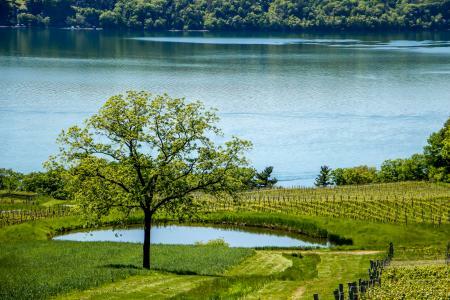 In a region well known for its award-winning Riesling, a map highlights 16 wineries plus cideries and a brewery along one of the Finger Lakes that is home to the oldest wine producing region in the eastern US. Several Ithaca places of interest are one-of-a-kind and recommended for children too. Sun Obelisk is the first of 11 markers along Sagan Planet Walk, a 3/4-mile self-guided walking tour that's a model of the solar system at one five-billionth of its actual size. Start in Ithaca Commons and continue to Cornell's Sciencenter, where you'll find hands-on activities and over 200 interactive exhibits. The exhibition is a memorial to former resident and Cornell professor Carl Sagan, the renowned astronomer. 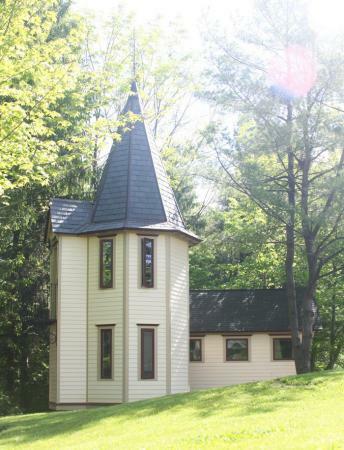 At The History Center of Tompkins County, you'll gain insights into the region's timeline including Eight Square Schoolhouse, a restored 1827 one room schoolhouse that is home to the museum's living history program. Also at Cornell, the admission-free Johnson Museum of Fine Art has a wide ranging collection, of which a highlight is the permanent 200-plus Louis Comfort Tiffany glass items of decorative art. The Cornell Laboratory of Ornithology is more than a bird lover's museum; it's a place to grab a pair of binoculars and join one of the guided bird watching walks that take place every weekend morning. Calling itself a foodie paradise, the local tourist board says, "We crunched the numbers and it's true: Ithaca, NY has more restaurants per capita than New York City!" The best-known is Moosewood Restaurant, operating as a collective for 40-plus years with an emphasis on healthy produce as illustrated in their 13 vegetarian cookbooks. Ithaca Ale House: Burgers and beer plus TV screens above the long bar are a sure-fire win with the college crowd. Just a Taste: Always bustling, visit this intimate place for family-style Spanish tapas and wine and a rear garden for temperate days. Mahogany Grill: Bring visiting parents to this traditional steakhouse with Italian flair, surf and turf items, and a lengthy wine list. Le Cafe Cent-Dix: Come for traditional French dishes like onion soup, steak frites, poulet roti, and trout amandine. Viva Taqueria & Cantina: This is the spot to pair your casual Mexican food with margaritas or sangria. Night time entertainment in Ithaca centers around a thriving live music scene and guest DJs in clubs where you can kick up your heels. Kilpatrick's Public House: Find three of the essential elements for a good time in an Irish pub: Trivia, karaoke, and a stone fireplace. Add good food and beer for a solid, yet informal, evening out next door to the Hilton Garden Inn. Lot 10: This two-level venue features a cocktails lounge downstairs and a night club upstairs. Dancing is to a DJ or occasional live entertainment and there's also a pool table and a jukebox. Level B Bar: Found in the heart of the Collegetown district, Level B is a popular place for dancing and a DJ in a plush clubby atmosphere. The Haunt: The music leans toward the blues at this venue open for ticketed live music events (some are 18-plus). The featured food is barbecue. Sacred Root: Open until midnight, this underground kava lounge and tea bar presents itself as a nightlife alternative for experimental music and conversation. Bandwagon: A farm-to-table restaurant by day, Bandwagon turns into a pub by night featuring local beers and wines. 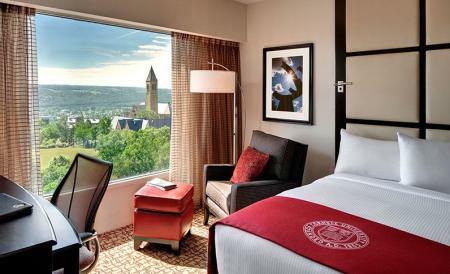 Late nights are Wednesday through Saturday until 1 a.m.
Cornell has the world's oldest and finest School of Hotel Administration, so visitors to Ithaca may opt to stay at AAA Four Diamond-rated The Statler Hotel on campus, where students participate in the 153-room property's management. As a "teaching hotel," 200 students work in every department, including the kitchen serving its three restaurants. In addition to The Statler Hotel, visitors to Ithaca can choose a well-regarded guest house or a cozy bed-and-breakfast establishment. This search engine makes it easy to select lodging by type of accommodation or requirements as well as vacation packages by desired dates. Looking for golf? The pet-friendly Homewood Suites by Hilton includes a round at the Robert Trent Jones Golf Course at Cornell University. When a spa sounds ideal, the family-owned La Tourelle Hotel houses the acclaimed August Moon Spa. One block from the Commons is The Hotel Ithaca, featuring a heated indoor pool and fitness center in a handy location. Should lakefront or forested hillside views appeal, vacation rentals are available in lodges, inns, manor houses and accommodation for eco-friendly upscale camping, such as the four separate cottages at Stone Quarry House. Those who have hiked the trails of upstate New York can attest that Ithaca is a special place. On April 5, 1892, a new 10-cent ice cream specialty was advertised by Platt & Colt's Soda Fountain in the Ithaca Daily Journal. Called a "Cherry Sunday," this remains the oldest-known record of the all-American treat with a cherry on top. In a claim to fame, Ithaca can document its distinction as birthplace of the ice cream sundae. America's first electric street lamps were lit on the Cornell University campus during the winter of 1875-76. Ithaca has its own currency system called the HOUR, each worth about $10. Equivalent to one hour's labor to 1991, the currency is widely accepted by local retailers and business. Gorgeous gorges is a nickname that Ithaca easily lives up to. From wine to waterfalls to winning accolades as a wonderful place, Ithaca is a wonderful place to visit any time of the year.